David Beljonne got his PhD in Chemistry with Professor Jean-Luc Brédas at the University of Mons-Hainaut in 1994. 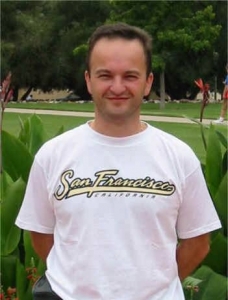 After post-doctoral stays at the Universities of Cambridge (with Professor Richard Friend) and Rochester (with Professor Shaul Mukamel), he became a research fellow of the Belgian National Science Foundation (FNRS) and is now FNRS Research Director. He is also a Visiting Principal Research Scientist at the Georgia Institute of Technology in Atlanta and serves as an associate editor for ACS Applied Materials & Interfaces. His research activities deal with a multifaceted modelling of the opto-electronic processes taking place in the bulk and at interfaces of (semi)conducting organic, 2D and hybrid materials for electronics and energy applications. “Electrostatic Phenomena in Organic Semiconductors: Fundamentals and Implications for Photovoltaics”. G. D’Avino, L. Muccioli, F. Castet, C. Poelking, D. Andrienko, Z.G. Soos, J. Cornil, and D. Beljonne. Journal of Physics: Condensed Matter 28 (2016) 433002. “Collective Molecular Switching in Hybrid Superlattices for Light-Modulated Two-Dimensional Electronics”. M. Gobbi, S. Bonacchi, J.X. Lian, A. Vercouter, S. Bertolazzi, B. Zyska, M. Timpel, R. Tatti,Y. Olivier, S. Hecht, M.V. Nardi, D. Beljonne, E. Orgiu, and P. Samori. Nature Communications 9 (2018) 2661. “How Methylammonium Cations and Chlorine Dopants Heal Defects in Lead Iodide Perovskites”. G. Nan, X. Zhang, M. Abdi-Jalebi, Z. Andaji-Garmaroudi, S.D. Stranks, G. Lu, and D. Beljonne. Advanced Energy Materials 8 (2018) 1702754. “Computational Design of Thermally Activated Delayed Fluorescence Materials: The Challenges Ahead”. Y. Olivier, J.C. Sancho Garcia, L. Muccioli, G. D’Avino, and D. Beljonne. Journal of Physical Chemistry Letters 9 (2018) 6149-6163.